I have called these scones, Coffeehouse Scones, because they are similar to what coffee shops and bakeries sell. But a better name may be Buttermilk Scones as buttermilk is used to bind all the ingredients together. This is a really nice tasting scone with a crisp outer crust and a soft, almost bread-like texture. They are delicious plain, or you can serve them with butter and jam, clotted cream and jam, or even lemon curd and clotted cream or whipped cream. In the summer I also like to use them to make Strawberry Shortcake. When you make scones do not over mix the dough, as this will result in a tough scone. That is why I prefer to make them by hand. But you can mix part of the dough in your food processor. The dry ingredients can be mixed together in the food processor and then you can add the cold butter and pulse just until you have coarse crumbs. Then transfer the mixture to a large bowl and add the buttermilk. Make sure to have your butter cold and I like to cut it into small cubes as this makes it much easier to blend it into the flour mixture. Now, you can add 1/2 cup (120 ml) of dried fruit (raisins, currants, dried cranberries or cherries) or chopped nuts or even chocolate chips to the dough. Once the dough is made, transfer it to a lightly floured surface, knead it a few times to get a smooth dough, and pat or roll into a 7 inch (18 cm) round. Then you can either cut the dough into rounds (with a cookie cutter) or wedges. 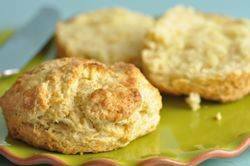 Lightly brush the tops of the scones with a little milk or cream to help with browning. These scones are baked at a fairly high temperature which produces that wonderful crisp golden brown crust. As always, scones are at their best served warm from the oven, however they can be covered and stored at room temperature for a few days or else frozen. If you are not familiar with buttermilk it has a nice thick creamy texture with a rich tangy buttery taste that makes baked goods tender. Whereas in the past buttermilk was made from the liquid left over after churning butter, it is now commercially made by adding a bacteria to whole, skim, or low fat milk. You can make your own buttermilk by adding 3/4 tablespoon of white distilled vinegar, cider vinegar, or lemon juice to 3/4 cup (180 ml) of whole or reduced fat milk. Let stand at room temperature for about 10 minutes before using. Another option is to use buttermilk powder which can be found in some grocery stores or in specialty food stores. Coffeehouse Scones: Preheat oven to 400 degrees F (200 degrees C) and place oven rack in middle of oven. Line a baking sheet with parchment paper. In a large bowl, whisk together the flour, sugar, baking powder, baking soda and salt. Cut the butter into small pieces and blend into the flour mixture with a pastry blender or two knives. The mixture should look like coarse crumbs. Add the buttermilk and vanilla extract to the flour mixture and stir just until the dough comes together. Do not over mix. Transfer the dough to a lightly floured surface and knead the dough gently and form into a 7 inch (18 cm) round that is about 1 inch (2.5 cm) thick. Use a 2 1/2 inch (6.5 cm) round biscuit cutter to cut the dough into circles. Transfer the scones to the baking sheet and brush the tops of the scones with a little milk. Bake for about 18-20 minutes or until golden brown and a toothpick inserted in the middle comes out clean. Remove from oven and transfer to a wire rack to cool. Can be stored at room temperature for a few days. Makes about 10 - 2 1/2 inch (6.5 cm) or 8 wedge-shaped scones.